We take reservations. We deliver FREE in Downtown Delray, and for a small charge to the Palm Beaches, Fort Lauderdale and in between. 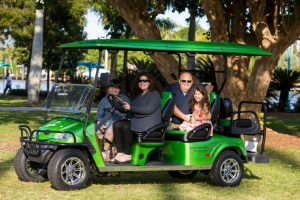 It’s so easy…and all of our golf carts are insured, as required by the State of Florida. Exhilaride accepts reservations up to one year in advance. Our online reservation system was developed to simplify your rental experience with Exhilaride. Select the date/time you wish to start your rental and the date/time you will return. Renters must be a minimum of 21 years of age, have an active driver’s license, in-force personal car insurance, and a MasterCard, Visa, Discover, AmEx, or Debit Card. All additional drivers must also be a minimum of 21 years old and present an active driver’s license. Select the size of Golf Car you wish to rent. We have 4 person and 6 person vehicles. If you plan to have “cargo” you will need to fold-down the rear seat, which will diminish capacity by 2 people. There is also a hidden storage compartment under the cargo bed. We deliver to YOUR location. If the local delivery address is not the same as your home address, please enter it in the “local” box on the form. The range of the Golf Carts is 45-50 miles per charge. When renting for more than one day, please insure there is a 110V outlet available that can be used to re-charge the vehicle. Complete all data forms with your personal home and driver information and credit card information. You do not have to complete the “Additional Drivers” section at the time of the reservation. You will be given an opportunity to add up to two drivers at the time of rental (driver’s licenses must be presented). At the completion of this online session, you will be provided a confirmation and price of your rental. Please call 561-573-8287 with any questions you may have or for assistance in completing the reservation process. In addition to receiving an email confirmation, you may request a printed copy of your completed Rental Agreement and relevant charges at the time of rental. All cancellations should be made one week in advance of the rental period. If less notice is given, you may be charged the full rental fee. The minimum rental period is a half day of up to 6 hours. We offer multi-day/overnight rentals as long as the renter has access to a standard 110V outlet which may be used to charge the vehicle. The average range with a complete charge is 45-50 miles. An onboard indicator shows the amount of charge remaining. When making a reservation, the method of payment is by credit card: MasterCard, Visa, AmEx, Discover or a Debit Card. This credit card will also guarantee the condition of vehicle until it is inspected at the conclusion of the rental period. Your card will be charged on the day of the rental for the rental fee. Please return the golf cart clean. If you are returning the cart in the morning, please return it fully charged.